Mega Bloks Halo Covenant Commander Just $7.99 At Kmart! You are here: Home / Great Deals / Christmas Deals / Mega Bloks Halo Covenant Commander Just $7.99 At Kmart! There is still time to get those gifts for Christmas! 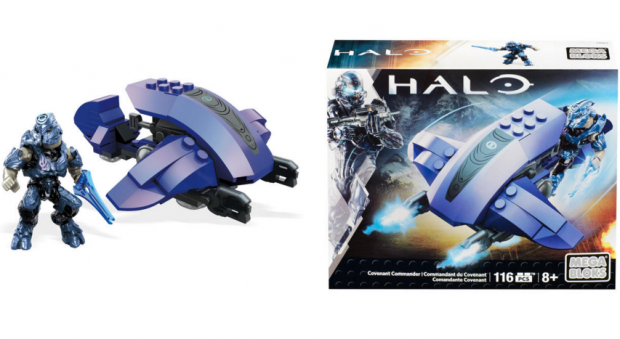 Right now you can get the Mega Bloks Halo Covenant Commander for Just $7.99 At Kmart! Down From $10! Prepare for an epic showdown with the Covenant Commander by Mega Bloks Halo, Jul ‘Mdama! wift as a lightning bolt, the Ghost is armed with twin rapid-fire plasma cannons that will send opponents diving for cover, even as it effortlessly skims over the roughest terrain with a boosted-gravity propulsion drive. Fast and deadly, the Covenant Commander is a force to be reckoned with! You can also choose to have it shipped to the store for FREE or get FREE shipping on orders of $35 or more! Be sure to sign up for Shop Your Way if your aren’t already a member before you shop! If you are not a member, sign up and start earning points today towards stores like Sears and Kmart! !